With the annual John Beargrease Sled Dog Marathon coming up this weekend we thought it would be fitting to pay homage to the forerunner of the snowmobile- the dog sled. Canines and humans have shared a bond since prehistoric times, a mutual relationship that has existed since the first humans befriended wild wolves, tamed them and incorporated them into their everyday lives. Some of these early humans developed a love for the colder climates of the world and moved north, brining their dogs with them. These snow loving prehistoric peoples faced the same dilemma we face today- how to efficiently move through the snow. They soon invented the sled and shortly there after one of these enterprising humans tied one of their dogs to a sled and viola, the dogsled was born. For the next several thousand years dog teams moved people, supplies, food, mail and medicine over great distances in the winter through areas that were inaccessible by any other means. With the advent of the internal combustion engine, many of our modes of transportation like the horse and buggy soon met their demise, being replaced by motorized vehicles. The snow, however, still presented a problem, as there were no reliable vehicles that could easily traverse the great frozen wilderness and reach the remote areas. Aircraft took over some of the duties, but for most things, the dog sled was still the best way to go. Necessity is the mother of invention and several Snow Belt natives began tinkering with ways to conquer the snow. One of these mechanical wizards was a Canadian named Joseph Armand Bombardier. Bombardier’s passion for finding a way to conquer the snow was fueled by personal tragedy. In 1934 Bombardier’s son developed acute appendicitis, he was 20 miles away from the nearest hospital and all of the roads were impassable due to heavy snow. Unable to reach help, Bombardier’s son passed away and a lifelong quest to find a mode of reliable over the snow transportation began. He was successful in creating a large vehicle that could carry several passengers or supplies to those in need but the dogsled was still one of the most reliable modes of transport. By the 1950′s all of that was about to change. The problem of reaching remote hunting and trapping locations was the driving force behind the tinkerings of the Heteen’s at the Hetteen Hoist and Derrick Shop in Northern Minnesota. In 1954 they created a “powered sled” and by 1956 they were producing these rear engined powered sleds. Meanwhile, Bombardier was experimenting with a small one-person vehicle that could travel over the snow for use by missionaries in the remote reaches of the Canadian wilderness. This vehicle had a forward mounted engine and utilized their new continuous rubber track design. In 1959 Bombardier released the Ski-Dog- it was billed in their sales literature as “The motorized dog team” when it went to production the name on the vehicle was changed to Ski-Doo and the modern snowmobile was born. Now there was a vehicle capable of doing everything the dog team could do. Within a decade, the sled dog team had gone the way of the horse and buggy and the snowmobile introduced the masses to the same type of adventure that had been monopolized by the adventurous mushers of the past. Now anyone could visit the remote isolated winter wilderness that previously had only been seen by a handful of human beings. It is this sense of adventure and freedom that catapulted the snowmobile to the top of the winter transportation hierarchy. 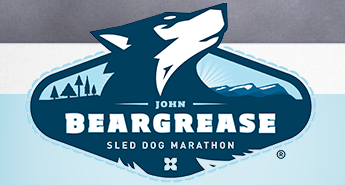 Today the John Beargrease Sled Dog Marathon keeps the tradition of the dog sled alive. 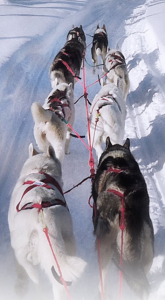 Ironically, a large portion of the race is run on the state snowmobile trail, which generally follows the same route that the old sled dog trail used to follow- so one could say that the evolution has come full circle. For a few days we surrender our trail to the panting of the sled dog, echoing not only their history but the history of the snowmobile as well, for without the dog sled paving the way into the wilderness there may never have been the creative spark planted in the minds of the snowmobile inventors of the past to create “The Motorized Dog team” There may have never been a Ski-Dog or a Polaris and we may not have the winter sport that we love so much today. This entry was posted on January 23, 2014 by John Hartley. First a quick trail update: Snow, Cold, Snow, Cold, Snow, Cold- seems like a pattern. If you were wondering how the little bit of ice affected the trails in the Arrowhead this past week the answer is it didn’t. All we can say is that the trails seem to get better every week- we keep getting little dustings of snow that help the washouts and bare spots get covered up and this week is no exception especially north of Duluth. If you are planning on riding up here this weekend you are going to find some fantastic trails. My first experience with a snowmobile came when I was just two years old. My parents had moved from Long Island, New York to (as crazy as it seems) Duluth, Minnesota. It was 1970 and there was a new winter activity taking the northern United States by storm- snowmobiling. My parents bought a house at the end of dead end road and my dad decided that he needed a snowmobile. He went out and purchased a brand new Ski-Doo Olympique 335. What followed were years of trips on the snowmobile to exotic destinations like Shakey’s Pizza. Just as I was getting old enough to appreciate having a snowmobile my little sister came along and the snowmobiles quickly disappeared in favor of diapers and formula, but I was hooked. After years of saving my allowance and baby sitting money I purchased my first sled at age fourteen, ironically a 1972 Ski-Doo Olympique 335. This entry was posted on January 17, 2014 by John Hartley. First off a trail update. We’ve had a little bit of snow and, like everywhere else, extremely cold temperatures. The clubs have been out grooming to gear up for the weekend and the trails are in about as good of shape as we have ever seen them. We expect a lot of sleds to be out this weekend. Snowmobilers are created in many ways. Many of us got our first taste of snowmobiling as kids, either riding with the family or putzing around the woods on an old Ski-Doo Olympique. We fell in love with the sense of freedom and adventure and have been hooked ever since. Others of us were more hesitant. One of my co-workers used to wonder why anyone would voluntarily go out in the freezing cold and ride around on a snowmobile- she thought it was insane. Then one day she was invited to go on a snowmobile ride with some friends and she begrudgingly went, not wanting to be a party pooper- the following Monday she came into work and siad, “I went snowmobiling this weeend and it was a lot of fun!” And I’m sure you know what happened next- a trip to the dealer for some better snowmobile clothes and a used sled parked in her garage. All of the pieces fell into place to make her first experience a positive one. To convert someone that hasn’t been on a sled before you need 3 things: Good Weather, Good trails and a halfway decent sled. This past weekend I had the opportunity to take one of my friends out on a snowmobile for the first time. He had an extensive background in motorsports being an avid four wheeler enthusiast and spending a few years on the superbike racing circuit, so hopping on a snowmobile seemed the next logical thing. The opportunity arose for him to borrow a sled from a close friend for a weekend and I was shocked to see him pull into my driveway with a newer Ski-Doo MXZ 600 E- Tech. One of my three criteria had already been met- not just a good sled but an awesome sled. I hooked him up with all the necessary gear and we departed. It was a early Saturday morning and the weather was a perfect ten degrees- Lets face it no one enjoys 20 below zero temps on a sled- especially your first tme out-criteria #2 fullfilled. And then once we got on the trail I crossed my fingers for the most important part of the puzzle- a trail in good condition. I know plenty of people who gave up on snowmobiling after one ride because they rearanged half of their internal organs on a washboard trail. When we pulled onto the trail we found that it had just been groomed the night before- Bingo. Needless to say after a ride like that he was hooked. He went out and bought himself some new riding gear and is trying to work out a deal with his friend to buy the MXZ. It is crucial as snowobilers that we add more to our ranks to keep the sport healthy. More snowmobilers means more registrations, more registrations means more money to maintain and expand the trail system and more snowmobilers in clubs means more people maintaining and building trails and more representation to protect our sport and trail system politically. It’s always fun to get someone out the first time and it can add another chapter to your long list of great snowmobile memories. See you on the trails! This entry was posted on January 10, 2014 by John Hartley. Hello All! Hope you had a great Christmas and New Years. First, a northern Minnesota trail update. What can we say. For the most part the trails are great. However, the heavy traffic, especially Christmas week, took a toll on some of the more heavily traveled trails. Most of this is due to the fact that everyone that has been dying to have good snow for the last two years was out on the trails over the past two weeks. This was a great sign to the rebounding health of the sport in Minnesota, but the trails suffered a bit from all of the use. Hopefully the fantastic grooming efforts of the local snowmobile clubs will continue to keep up. Believe it or not some trails could benefit from a little more snow to help fill in some bare spots. Now that the Vikings season has put us out of our misery we can focus our entire weekends on riding! January and February are also the time that we see the many charity rides that take place around the state. A charity ride is a great way to spend time on your sled and help others in the process. Every year Minnesota snowmobilers raise over one million dollars for wide variety of charities including those that support cancer research, MS, ALS, Special Olympics and a variety of others. One of the charity rides that the staff of snowmobiletrail.com is heavily involved with is the annual Yeti Tour which benefits the March of Dimes. Like most charity rides, the Yeti Tour was created by a group of snowmobilers who wanted to make a difference. It was the brainchild of Nate and Kelly Alvar, who became involved with the March of Dimes after being faced with personal heartbreak, losing their first child, Isaiah to severe birth defects. Tragically, their second son, Mason, was three born months premature and passed away after complications from emergency surgery just one week after being born. Today Nate and Kelly have two healthy boys, Jonas (5) and Elias (1), and they credit organizations like the March of Dimes for making advancements that helped give Jonas and Eli a healthy start in life. “I come from a snowmobiling family,” said Nate, “I have a couple of close friends that I always ride with and one day Kelly said ‘You guys should do something that involves snowmobiling and the March of Dimes’ and things just grew from there.” The Yeti Tour is a one day 140 mile ride that originates and ends at the Sunset Bar and Grill in Duluth, Minnesota. The event takes place on Saturday, January 25th and there are still openings available for riders. “This is a fun, rider friendly event,” said Alvar. Now in its fourth year the Yeti Tour has raised over $50,000 for the March of Dimes. Unfortunately the ride portion of the Yeti Tour has been cancelled the last two years due to lack of snow, but with this years early December storm the ride will go on as scheduled. If you would like to take part in the Yeti Tour they are always looking for riders and donations. You can visit their website at www.yetitour.com for information on how to register or donate. This entry was posted on January 5, 2014 by John Hartley.